The Champ is back! 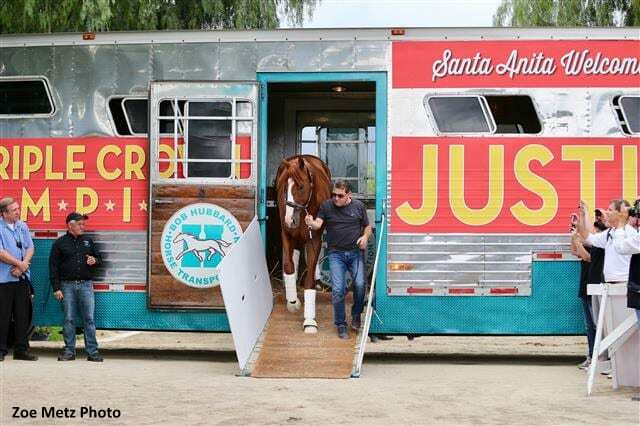 Bob Baffert's undefeated Triple Crown Champion Justify returned home to Santa Anita early Sundayafternoon, as he stepped off a Bob Hubbard Horse Transport van at 2:36 p.m. Justify, who embarked this morning from the Louisville, KY airport at 9:37 a.m. ET and landed following a 3hr. and 30 min. flight at Ontario International Airport at 1:07 p.m. PT, was escorted by four Arcadia Police Department marked units and was greeted by Baffert, his Hall of Fame jockey Mike Smith, a large group of media and horsemen at Baffert's Barn 5, which adjoins Santa Anita's main stable gate. The 18th Santa Anita Derby participant to win the Kentucky Derby, Justify joined Seattle Slew as the only undefeated Triple Crown Champion by winning the Belmont Stakes on June 9. Undefeated in three Santa Anita starts, including victory in the Grade I, $1 million Santa Anita Derby on April 7, Justify, America's 13th Triple Crown winner, will resume training at The Great Race Place this week and be paraded between races this coming Saturday, June 23. Santa Anita will also be giving away Triple Crown posters to the first 4,000 attendees on Saturday, free, with paid admission. Justify's regular rider Mike Smith, will be signing the Triple Crown posters on Saturday, from 10:30 to 11:30 a.m. near the Kingsbury Fountain, on the west end of Santa Anita's Paddock Gardens area. The exact time of Justify's appearance on Saturday will be announced in the coming days. For additional information, including specificity regarding Justify's Saturday appearance, please visit santaanita.com. This entry was posted in NL List, Triple Crown and tagged Bob Baffert, Horse Racing, Justify, mike smith, santa anita, santa anita derby, santa anita park, thoroughbred, Triple Crown by Mike Willman/Santa Anita. Bookmark the permalink.